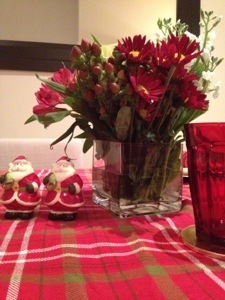 uhhh…is it too late to show you some of my christmas decorations? This is going to be a post about Christmas. On January 1st. I need to ask that you just bear with me. I could definitely spin this post in another way: an “ideas for next year, WAY in advance” post…or a “let me compare and contrast this year and last year’s holiday as I reflect on the New Year” post…but I’d rather be brutally honest. SO truth time: the past week has caused me to go completely crazy-town. We had a beyond busy holiday (as did everyone) and then jetted off to Cali the day after Christmas BUT I soooooo wanted to post about some of my holiday stuff, which is SO outdated, totally over, last week’s news (literally) and it is obviously a blogging faux pas to do so. Uhhh…I’m going to show you anyway. ‘kay? 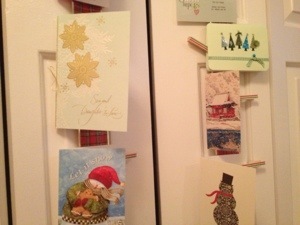 I wanted a new display for our holiday cards this year and decided to do something that would incorporate our blank closet doors. 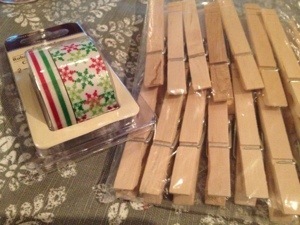 I bought this crafting tape and wooden clothespins to do something a bit more festive. 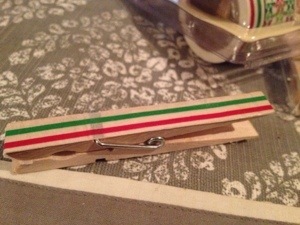 The smaller crafting tape was the perfect width for the clothespins! All I had to do was cut it to size and slap it on. Easy and quick. 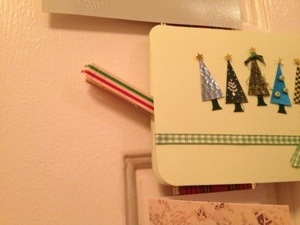 I hung a thick, plaid ribbon from our closet doors and used the clothespins to hang the cards. Unfortunately, my idea turned imperfect when, after a couple of hours, the tape started peeling off the sides of the clothespins. A little glue would have solved the problem but I just kept tucking them back in every time I walked by. 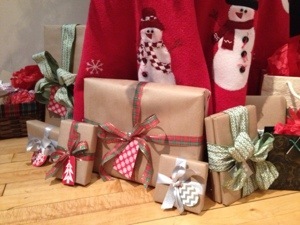 I went Kraft-paper-happy with my wrapping this year. I shamelessly stole this idea from every other Pinterest pin and all corners of the Internet. I bought a big roll of Kraft paper from Staples, got some cute tags at Target and picked up a ton of different ribbon from Michaels. I had so much fun and loved the look. I will definitely do some variation on this next year. Here is my new favorite new holiday decor addition: I used two hurricane vases to display colorful, sparking and glittery holiday balls. 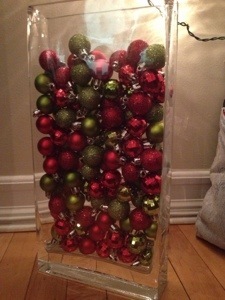 I picked up 6 packs of these mini ornaments from Target and dropped them right in. I kept the larger of the two vases on the floor and it just popped! 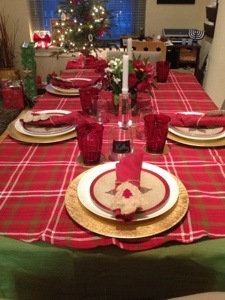 Hope you and yours celebrated a happy holiday season!